Champion Golden State Warriors made the first stroke in the final NBA title series. Tonight, the wars won the opening meeting with Cleveland Cavaliers with a score of 124:114 (29:30, 27:26, 28:22, 23:29, 17:7) after extra time. The match was played at the Oracle Arina in Oakland. The fight was extremely challenging and exciting, and the charge in both teams was enormous. At first the guests took a slight advantage and the first scored in the score. Golden State, however, did not allow them to break away seriously and at half time there was a full draw in the 56:56 score. Clay Thompson was injured in the first quarter, but fortunately the hosts did not turn out to be serious and he soon returned to the field after being briefly examined in the dressing room. Later on, LeBron James also suffered a dungeon strike with a strike in Dramond Green`s face, but he also managed to keep the match, though with a flushed eye. Since the beginning of the third quarter, the initiative has gone to the Warriors` side, which led to the result and were already more stable on the parquet. Cleveland, however, did not allow himself to lag seriously, and until last he held the intrigue, and even twice managed to get his lead back. So came the real drama at the end. At the last minute, the Golden State led with a point, but LeBron`s great breakthrough brought him a foul and a two-point lead to Cleveland. 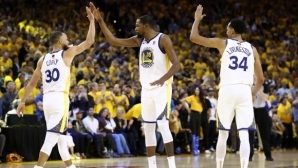 There was a rather controversial situation in which instead of a Kevin Durant jet foul, a defeat was given to James in defense, and Warriors again regained equality. Then LeBron did an incredible break, but Steph Curry replied with an even more impressive break with a foul and a basket with which he took the team forward. The last attack in the game was Cleveland, who won a foul, but George Hill missed the second shot, then the guests won the fight under the basket, but JR Smith did not get well and did not make any sense. In the sequel, Golden State rushed and threw a few threes, sending the opponent into a knockout. At the very end of the match, Tristan Thompson was cast out for elbowing to Livingston`s face, then for a bit of a fight on the pitch, but the passions were quickly quenched. Eventually the champions started to defend their title. Steph Curry was the most successful winner with 29 points, with 9 assists and 6 rebounds. Kevin Durant finished with 26 points and Clay Thompson scored another 24 points for his team`s success. LeBron James was once again a true locomotive for Cleveland, putting the mocking 51 points, but this time they were inadequate. He also has 8 rebounds and 8 assists on his account. Kevin Love was also 21 points and 13 rebounds.